"Assessment uses Insight Community results from the survey to enhance the customer services area and external communications. For example, one of the branch's strategic goals is to enhance customer service. The team then sets the benchmarks and uses the results to see if they meet them." 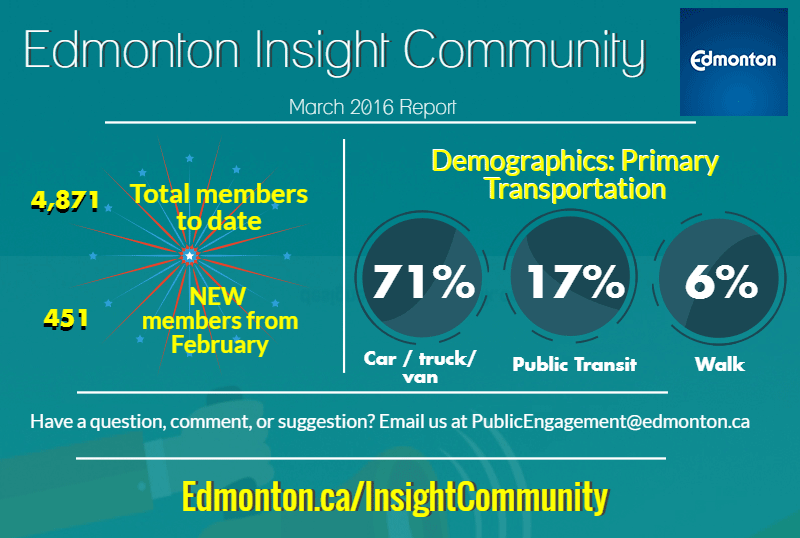 "Many thanks to all the Edmonton Insight Community members who gave us their feedback about our Vision 2020 plan. Your thoughtful input about the future of our campus is so important to Northlands being able to chart a course that will fit well for the citizens of Edmonton now and over the coming years. We appreciate the time you took to consider our Vision 2020 plan, to offer your “insight” and most of all, for helping us to get it right." "Thank you for input regarding City Council's moment of reflection in the March Mixed Topic. Responses will be considered in developing parameters ​for Council's moment of reflection and will be incorporated in the report going to Council."